Google Operating System noticed Google News added a new box to the side bar named “Most shared.” The most shared box must be using social sharing features to see the most shared stories via Google Reader, Twitter, Gmail, Google Buzz and maybe even Facebook? 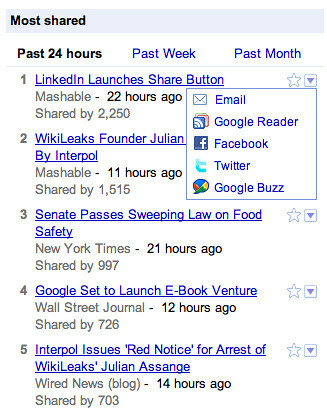 Google News was testing a friends news box that seemed to track and list what your friends were sharing. I am not sure if this will replace it, be integrated with it or what. But right now, I am personally seeing the “most shared” box on the bottom right panel on Google News.